Every so often, there is a moment that comes along that takes your breath away and albeit brief, it can really move you. As someone whose had hundreds of facials over the years, I never thought I’d have said experience while getting my pores cleaned out, but here we are. I was eager to try my first chakra-balancing facial, especially because I had heard amazing things about Emma Goodman at Skin Worship® in Los Angeles — my friend and celebrity hairstylist Justine Marjan is a mainstay in Emma’s chair as are Dua Lipa, model Sofia Richie, and influencer Rocky Barnes. While I was sure it was going to improve my skin, I wasn’t prepared for the spiritual impact it would leave behind. I’m relatively savvy when it comes to new age spirituality: I dabble in tarot card reading, believe in the energy of crystals, and have manifested many things into reality. Heck, I’ve even had a chakra-cleansing massage at the world-renowned (and completely amazing) Yäan Wellness Center™ in Tulum. But none of this prepared me for the life-altering moment I would experience with Goodman during her Maintenance Facial at Skin Worship ($190 for one hour). First, let me explain what a chakra-balancing facial is. In addition to all of the skin-rejuvenating elements of a standard facial (steaming, cleansing, extractions, etc. ), chakra-balancing uses crystals, manifestation, and a guided meditation to help open you up. This is said to help release stifling energy. “I just feel where people are out of balance and see where they’re at emotionally,” explains Goodman. 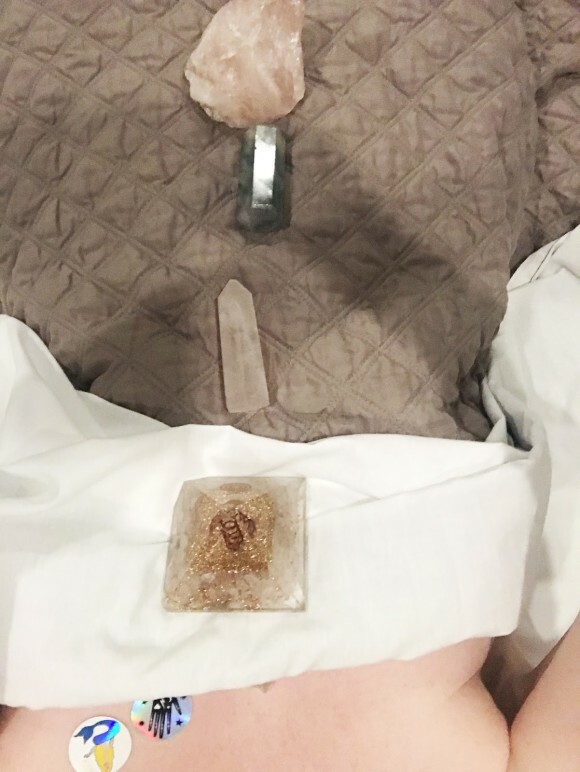 “Then I go in with different crystals, and set intentions with a guided meditation to help open up those areas and release and balance energy,” Goodman explains. She also gives you a Body Vibes™ sticker based on your reading. These stickers are programmed with Solfeggio frequencies that are said help harmonize specific bodily functions. 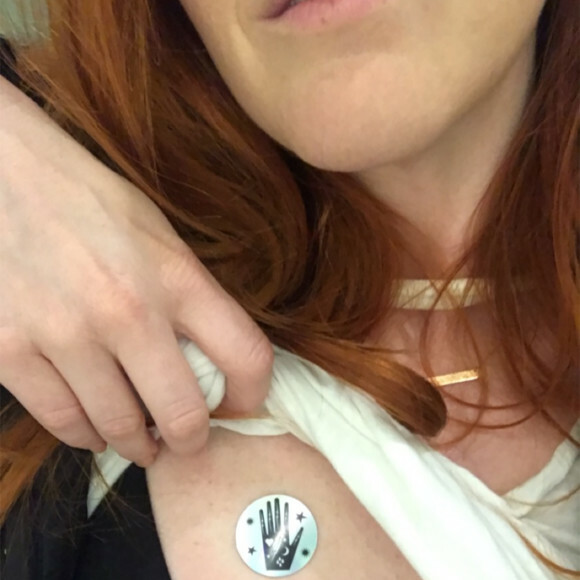 My entire visit with Goodman was based around opening and cleansing the heart chakra, so she fittingly gave me the “At the Beach” sticker ($30 for five). This one is designed to focus on the heart chakra with a 639Hz Solfeggio frequency, and aims to harmonize relationships, heal conflict, and connect us to others. I went for a sticker cocktail and also picked “Energy”($30 for five) to facilitate change, endurance, and empowerment. 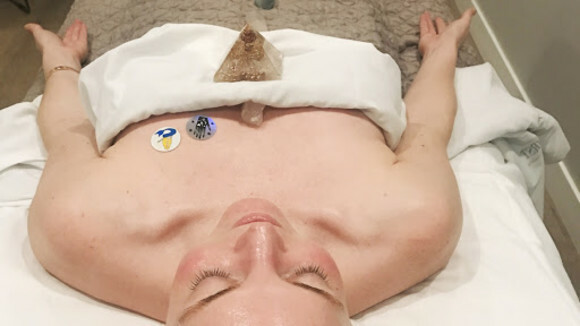 With that mindset, a quick reading into the deeper meaning of the card, and a large crystal on my breast bone, we began the facial. After a double-cleanse, we went right into a Diamond Dermabrasion™ treatment to slough off dead skin cells, suction up cell debris, and re-texturize the skin. It’s similar to a microdermabrasion procedure, but instead of blasting tiny crystals into the skin, it uses a diamond-tipped wand (much cleaner!). “It’s also great to eliminate bacteria, blackheads, and for anti-aging as well,” Goodman notes. For a deeper exfoliation, Goodman applied a gommage. This acts as both an extractor and an exfoliation in one treatment — or, as she refers to it, “a callus remover for your face, peeling away the dead layers of skin.” It’s almost like a scrub, but cooler: a gommage is applied in a thin layer across the face. Once it dries, Goodman rubs it off. Any dead cells, debris, and any pore congestion at the surface is pulled away with the gommage as it is wiped away from the skin. To get even more gunk out of my skin, Goodman moved on to extractions. But she doesn’t use steam to soften up the skin — she finds it can be too stimulating for some people and can make others feel suffocated. Instead, she prefers to use pure magnesium oil. “This vasodilator brings fresh, new blood and oxygen to the surface, and also dilates the pores for extractions,” she explains. After saying bye-bye to those blackheads, it was time for some light therapy. In the past, I’ve only had red and blue light therapy, but this time we used green. Green is said to be calming and healing, so it may be ideal for someone with sensitive and reactive skin. While under the light, Goodman applied a protein-rich avocado mask, and then under the oxygen dome I went! This was my first time using an oxygen dome and it was (literally) one of my coolest facial experiences to date — and it gave me a glimpse into what Michael Jackson experienced nightly in his Hyperbaric chamber. The air is so cold, crisp, and clean that it gives you a head rush with the first few breaths. That’s because it increases oxygen levels at every cellular function of the body, while helping to fight bacteria and stimulate the release of growth factors and stem cells. After a few minutes sucking in pure oxygen, it was back to basic air — and time to balance my chakras. In addition to the crystal already on my chest and the rose quartz she’d placed on my pelvis, Goodman also gave me two more stones. For my left hand, I received an additional rose quartz (for increased self-love, improved relationships, and more compassion) and for my right hand, a rainbow fluorite crystal (for transformation, manifestation, and communication). She clearly thought I needed lots of heart chakra-clearing, and she was most definitely right! From there, she began guiding me through a calming and relaxing meditation, and then through a series of manifestations, where I set intentions for work and personal life. Goodman has a rare gift: she is a true healer in every sense of the word. During the meditation portion, she talks to you in a way that almost sets you into a trance. However, it was the visceral and visual experiences she guided me through that were truly life-changing. Midway through intention-setting, I felt an urge to open my eyes, so I did. The room we were in — a standard facial room with overhead recessed lighting — had turned entirely pink, with jolts of candy-colored light pouring out from the bulbs overhead. I felt so at ease, open, and at peace, so I paused a few moments in total awe at the spectacle before my eyes. I had never experienced complete tranquility quite like this before: I felt so open, I could literally feel the energy pouring in and out of me like rapid running water, all set in this beautiful, fuchsia-lit room. I laid there completely stunned. What do you mean you don’t have pink lighting? The entire room was lit up! I saw it with my own eyes! No, I wasn’t hallucinating — what I witnessed was a massive energy flow. Because Goodman had the ability to make me feel totally at ease and unjudged, it gave me the perfect moment to be open to such a flow of energy. Plus, everything that we worked on during this session — from the card I pulled at the beginning of the session, to the crystals she gave me to hold, and the Body Vibes sticker she chose for me to wear — all focused on cleansing the heart chakra; the color pink that I saw is directly related to the heart. My mind was blown. I’ll be honest: it was hard to focus after going through a moment like that. I was completely consumed by the experience — and still kept replaying the striking pink lights and the peacefulness of the moment in my head. But Goodman completed my facial nevertheless, airbrushing oxygen onto my skin to help infuse trace minerals like silver, gold, and copper. 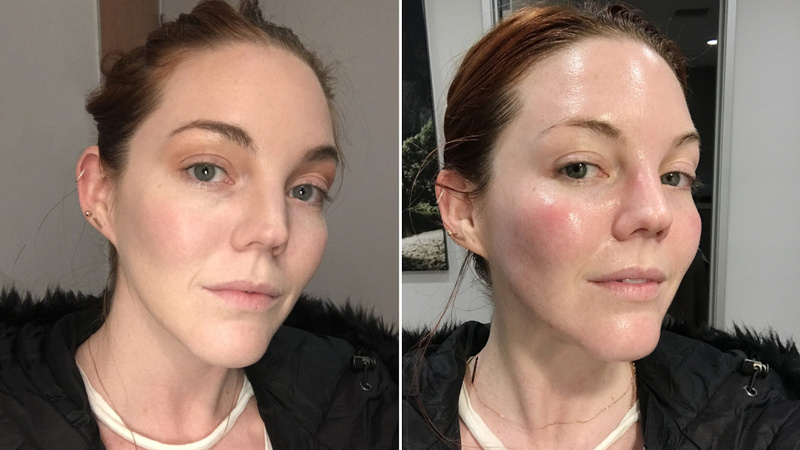 She then slathered me with hyaluronic acid, peptide-rich eye cream, and a face oil, sending me on my way with my most glowy, gorgeous complexion ever. 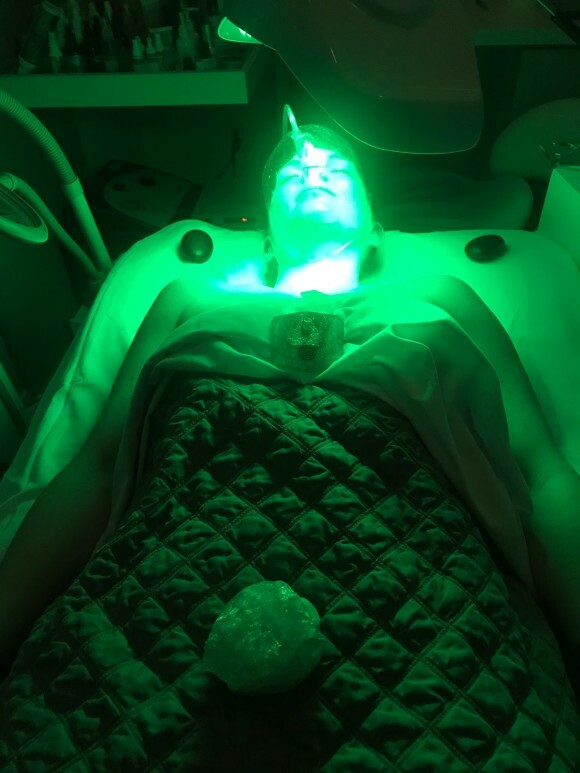 Now, I can’t guarantee that everyone will see lights change colors when they book an appointment with Goodman at Skin Worship, but I do know this: you will likely leave changed for the better in some way — whether it’s your complexion or your chakras. If you go in with an open mind and a willingness to heal, I have a strong feeling you’ll have your own out-of-this-world energy experience. I can’t wait until my next visit. Service was gifted to the author for the purpose of writing this article.